I love the peeled paint background on Terrible Twos, which I made by using black and green paint with Vaseline. For me, the images work so well together, and it's fun. 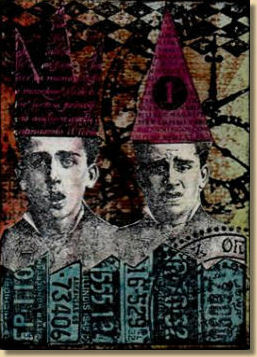 Another of my favourites is Man 2 Man, which I made for a challenge on my artist trading card blog. I created the background from a number of rubber stamps which I love, and I think that the colours are sooo scrummy. Thank you, Chriss, for sharing some of your favourite artist trading cards with us. We liked your cards very much, but were disappointed that you didn't tell us more about them. We'd have been particularly interested to know more about that peeled paint technique that you mentioned. 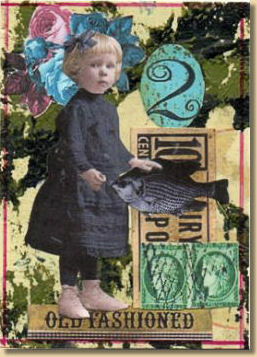 We were already aware of Chriss's beautiful work, and her artist trading card swap group Swap 'Til You Drop. You can find out more about this in our article on How to swap artist trading cards. If you've enjoyed seeing Chriss's work displayed here on our site, you'll probably find her blog to be well worth a visit.